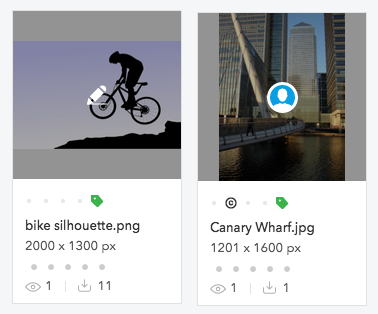 Tip: Images can be rotated or flipped from within the Pro client without opening them in another application. See Editing images using the Pro client of Elvis 6. As a quick overview of what is described in this article, the following are the main actions for opening a file, editing it in some way and saving it back to Elvis. Note: It is assumed here that the latest version of Elvis is used. Older versions may work differently. Step 1. 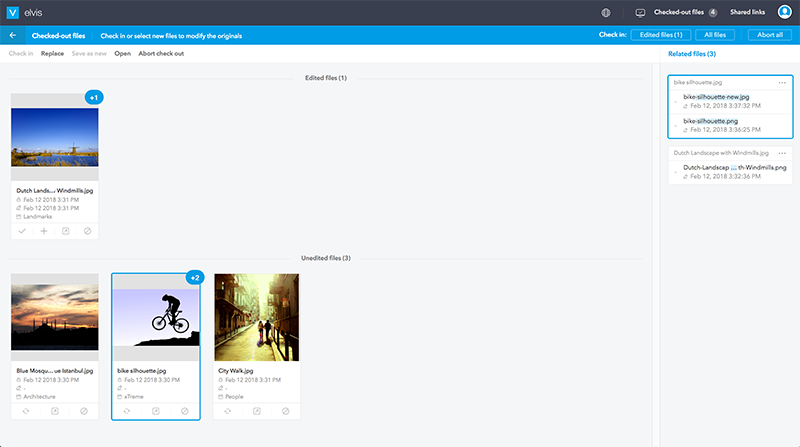 Using the Pro client, locate the file that you want to edit. Step 2. Select it and in the menu bar choose Check out. The file is opened in its application. Step 3. Edit the file in some way and save it. Step 4. 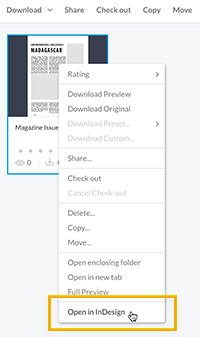 Access the Checked-out files page in the Pro client and select the file that you want to save back to Elvis. A file can be edited and the changes can be saved back to the original file in Elvis. A file can be replaced by another file. A file can be edited and saved as a new file in Elvis. A file can be duplicated and saved as a new file in Elvis. For full details see the rest of this article. Depending on the version of Elvis and any supporting applications that may or may not be used, some differences exist in the process of working with checked-out files. The most advanced methods of working with checked-out files are available when using the Pro client of Elvis 6.11 or higher together with Elvis Agent: a small application that runs in the background on the same system on which the Pro client is used. With Elvis Agent, a file can be automatically opened in its native application and checked-in again to Elvis in a single action. When Elvis Agent is running, an icon is shown in the notification area (Windows system tray) or in the menu bar (MacOS). Figure: The Elvis Agent in the notification area of Windows (left) and in the menu on MacOS (right). Tip: Configure your system in such a way that Elvis Agent is automatically started when the system itself is started. The Pro client also verifies if a connection with Elvis Agent exists and will show a notification when the connection is lost or re-established. An icon next to the 'Checked-out files' button in the toolbar shows the current status. Figure: The Elvis Agent Status icon in the Pro client shows whether or not it is connected to Elvis Agent. When Elvis Agent is running but the Pro client shows that it is not connected, click the icon in the Pro client to try and re-establish the connection. Note: When the Pro client is running in a Web browser tab that is not active, the connection to Elvis Agent can be lost. This is a result of the Web browser putting services in non-active tabs into sleep mode. For details about how to prevent this, see Preventing the Elvis 6 Pro client from losing its connection to Elvis Agent. When Elvis is not configured to use Elvis Agent (in case of Elvis 6.11 or higher), or when Elvis Agent is not supported for a version of Elvis (applies to Elvis 6.10 or lower), only basic functionality for working with checked-out files is available in the Pro client. Steps for using the Pro client without Elvis Agent are described at the end of this article. Note: It is assumed here that the Pro client of Elvis 6.11 or higher is used in combination with Elvis Agent. For other scenarios, see File check-out without the use of Elvis Agent. Click Check out in the menu bar. A file is only opened automatically when Elvis Agent is running and connected. Edited files. When the file is edited and saved using the original file type and file name, it appears as an 'edited file'. Related files. When a file is saved using a different file type or file name, it is seen as a version that is related to the file that was originally checked out. 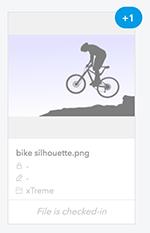 Example: Here, a file named 'bike silhouette.jpg' is checked-out and saved as 'bike-silhouette.png'. Everything after 'bike' in the new file name is different compared to the original name and is therefore highlighted. Replace is available for all files and allows you to replace the originally checked-out file by a different file. This will typically be a different version of the same file but can potentially be a completely different file. The file that you are replacing the original file with has to be stored outside of Elvis though (such as on your local system or a network drive). The following table shows the actions that can be performed and what the result of that action is. Checking-in the original file The original file is updated. A file named flower.jpg is edited and saved as flower.jpg. Replacing the checked-out file by another file The original file is replaced. 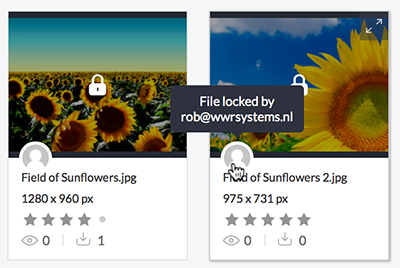 A file named flower.jpg is replaced by file flower-2.png. The original file flower.jpg is replaced as flower.png. The file name is retained. A new file is added to Elvis. The original file is still in place. A file named flower.jpg is edited and saved as flower.png. The file flower.png is saved to Elvis as a new file. The original file flower.jpg still exists. A file named flower.jpg is saved as flower.png or duplicated as flower-2.jpg. The file flower.png or flower-2.jpg is saved to Elvis as a new file. Canceling the check-out of a file The original file is untouched as if it was never checked-out. Each action is described in more detail below. In this process, changes are made to a file and the original file is updated with these changes. During this process, the edited file is saved using the original file name and file type. The file is opened in its native editor. Step 2. Edit the file in some way and save it using the same name and as the same type as the original file. The 'Check in' option is only available when the Elvis Agent is running and connected. Check that this is the case. Tip: When Elvis Agent is running but the Pro client shows that it is not connected, click the Elvis Agent icon in the Pro client to try and re-establish the connection. As long as there is no connection between the Pro client and Elvis Agent, the Replace option needs to be used (see below). In this scenario, the checked-out file is replaced by another file. This is typically done to change the file type of a file. The file that is used as the replacement could be a completely different file and of a completely different type, or it could be a variation of the original file that was stored somewhere. During this process, the file name of the original file is retained. Example: A file named flower.jpg is replaced by flower.png. Note: The file that you are replacing the original file with has to be stored outside of Elvis (such as on your local system or a network drive). Step 2. (Optional) Edit the file in some way and save it using a different name and/or as a different type as the original file. Step 4. Browse to a file on your local system that you want to replace the original file with and double-click it or select Open. Tip: The original file can at any time be restored using the History panel. After opening a file and editing it, instead of using the edited file to replace the original file with, the edited file can also be saved to Elvis as a new file. Step 1. On the Checked out files page, select a file in the Edited files section. Step 3. 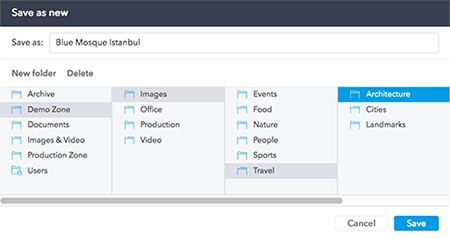 Browse to the folder where you want to save the file and click Save. The new file is added to Elvis. Info: This feature requires Elvis 6.23 or higher in combination with Elvis Agent. For other scenarios, see File check-out without the use of Elvis Agent. In this method, the original file is duplicated, saved with a different name, or saved as a different file type. Instead of using the new file to replace the original file with, the new file can also be saved to Elvis as a separate file. Step 1. Duplicate the checked-out file (for example by copying it in the Elvis Checkouts folder), or save it using a different name or as a different file type. The new file appears in the Related files panel. Step 2. In the Related files panel, hover the mouse pointer over the thumbnail and click the Save as new icon. The new file is removed from the Checked-out files page. The new file that was created on the system is removed. File check-out: The folder in which the file is saved needs to be manually selected (depending on how the preferences of the Web browser are set) and the checked-out file needs to be manually opened from the folder in which it is downloaded. The checked-out files that were saved on your system are not removed, you may want to remove these manually from your system. The Related files panel is not available without Elvis Agent, and therefore the Replace option in that panel is also not available. Note: In Elvis 6.10 and earlier, the Replace option is called 'Update'. Abort check out. Cancel the check-out of the file. When using Elvis 6.11 or higher, the File check out page shows all files in the 'Unedited files' section. 30 October 2018: Updated section 'Quick start' by adding a summary of the actions that can be performed. 30 October 2018: Updated section 'Working with checked-out files' by adding a table of the actions that can be performed. 30 October 2018: Updated section 'Working with checked-out files' by adding steps for saving a related version as a new file. 9 October 2018: Updated section 'Pro client with Elvis Agent' with a note about losing the connection to Elvis Agent when the Pro client is running in a non-active tab. 9 October 2018: Updated section 'Described processes' with a link to installing Elvis Agent.